The use of the English language in most member countries of the Commonwealth of Nations was inherited from British colonisation. Mozambique is an exception – although English is widely spoken there, it is a former Portuguese colony which joined the Commonwealth in 1996. English is spoken as a first or second language in most of the Commonwealth. In a few countries, such as Cyprus and Malaysia, it does not have official status, but is widely used as a lingua franca. Many regions, notably Canada, Australia, India, New Zealand, Pakistan, South Africa, Hong Kong, Malaysia, Brunei, Singapore, Sri Lanka and the Caribbean, have developed their own native varieties of the language, primarily at the spoken and informal written level. These varieties of English are sometimes collectively called Commonwealth English; this term may have originated with the 1962 publication of Aid to Commonwealth English, a TEFL resource, by the British Council. In practical usage, the term usually includes the original British English, as well as Irish and Hong Kong English (despite neither country being a member of the Commonwealth), but often excludes Canadian English, which has many distinct features due to amalgamation with American English and influences from French. 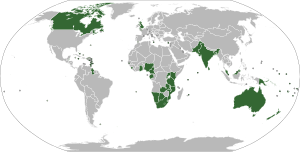 Written English as used in the Commonwealth generally favours British spelling as opposed to American, with some exceptions in Canada, where there is a strong influence from neighbouring American English (collectively, the US and Canadian dialects form North American English). Few Commonwealth countries besides Canada and Australia have produced their own dictionaries and style guides from major publishers, and rely on those produced in the United Kingdom, especially for formal writing. Southern Hemisphere native varieties of English began to develop during the 18th century, with the colonisation of Australasia and South Africa. Australian English and New Zealand English are closely related to each other, and share some similarities with South African English (though it has unique influences from indigenous African languages, and Dutch influences it inherited along with the development of Afrikaans from Dutch). The vocabularies of these dialects draw from both British English (in the main) and American English (especially for recent terminology), as well as numerous native peculiarities. Canadian English contains elements of British English and American English, as well as many Canadianisms and some French influences. It is the product of several waves of immigration and settlement, from Britain, Ireland, France, the United States, and around the world, over a period of almost two centuries. Modern Canadian English has taken significant vocabulary and spelling from the shared political and social institutions of Commonwealth countries. Caribbean English is influenced by the English-based Creole varieties spoken, but they are not one and the same. There is a great deal of variation in the way English is spoken, with a "Standard English" at one end of a bipolar linguistic continuum and Creole languages at the other. These dialects have roots in 17th-century British and Irish English, and African languages, plus localised influences from other colonial languages including French, Spanish, and Dutch; unlike most native varieties of English, West Indian dialects often tend to be syllable-timed rather than stress-timed. Second-language varieties of English in Africa and Asia have often undergone "indigenisation"; that is, each English-speaking community has developed (or is in the process of developing) its own standards of usage, often under the influence of local languages. These dialects are sometimes referred to as New Englishes (McArthur, p. 36); most of them inherited non-rhoticity from Southern British English. Several dialects of West African English exist, with a lot of regional variation and some influence from indigenous languages. West African English tends to be syllable-timed, and its phoneme inventory is much simpler than that of received pronunciation; this sometimes affects mutual intelligibility with native varieties of English. A distinctive East African English, often with significant influences from Bantu languages such as Swahili, is spoken in countries such as Kenya or Tanzania, particularly in Nairobi and other cities where there is an expanding middle class, for whom English is increasingly being used in the home as the first language. Small communities of native English speakers can be found in Zimbabwe, Botswana, and Namibia; the dialects spoken are similar to native South African English. India has the largest English-speaking population in the Commonwealth, although comparatively few speakers of Indian English are first-language speakers. The same is true of English spoken in other parts of South Asia, e.g. Pakistani English, and Bangladeshi English. South Asian English phonology is highly variable; stress, rhythm and intonation are generally different from those of native varieties. There are also several peculiarities at the levels of morphology, syntax and usage, some of which can also be found among educated speakers. Southeast Asian English comprises Singapore English, Malaysian English, and Brunei English; it features some influence from Malay and Chinese languages, as well as Indian English. Hong Kong ceased to be part of the Commonwealth in 1997. Nonetheless, the English language there still enjoys status as an official language. ^ "New criteria for Commonwealth membership". TheCommonwealth.org. Commonwealth Secretariat. Retrieved 15 March 2018.